​​ Terming such schemes as “fraud”, the authority said SEBI has already declared “assured returns” as illegal Ponzi schemes. 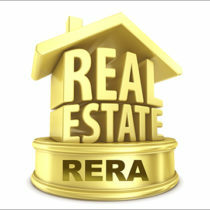 GURUGRAM: Haryana Real Estate Regulatory Authority (H-Rera) is going to issue notices to developers who are trying to lure people to invest in their residential and commercial projects, promising “assured returns”. Terming such schemes as “fraud”, the authority said SEBI has already declared “assured returns” as illegal Ponzi schemes. To lure people to invest in their real estate projects, many developers are offering “assured returns” schemes, in which investors in residential projects are assured of a fixed rental income, while in commercial projects, those assured returns go up to as much as 12%. 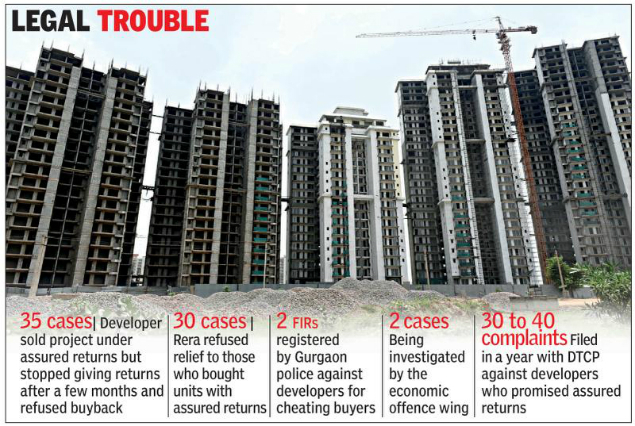 “It has come to our notice that many real estate firms are trying to lure investors through “assured returns” schemes, which is basically a financial scam promising very high returns,” said Gurugram H-Rera chairman K K Khandelwal, adding the body is preparing a list of such companies for criminal action by the authority. “We’ve decided to take action against developers who, under the garb of real estate projects, are fooling people by promising “assured returns”,” he said. Khandelwal added that even agents who are selling such projects will be booked for unfair practice. “If a developer insists on their project be sold as promising assured returns, agents should approach H-Rera. The authority will probe the complaint, and if a developer is found guilty of such practice, their registration will be cancelled,” he said. He further advised promoters to desist from such schemes, which SEBI categorises as purely an investment scheme and not a real-estate project. “Such schemes violate the H-Rera Act, and its rules, regulations and directions,” said Khandelwal. The authority also advised buyers invest in such schemes at their own risk. In around 25-30 cases involving “assured returns” schemes, H-Rera has already refused relief to complainants. Gurugram police have reported that complaints about “assured returns” projects are pouring in at their doorsteps. “We’ve registered FIRs in two cases. Two more complaints are being investigated,” said Vijay Kumar, in-charge of the economic offences wing (EOW) of Gurugram police. Sanjeev Kumar, a homebuyer, said despite SEBI declaring “assured returns” schemes as illegal, many developers are offering such schemes. “They (developers) continue to put up hoardings and online adverts about “assured returns” schemes,” said Kumar, who asked why police was not taking any action against these. What is a sale deed and terms and conditions that home buyers should be aware of..